When we moved to Sonoma County a while back, we landscaped our front yard as we did when we lived in our previous house, lots of flowering plants, grasses and delicate shrubs. What we did not realize is our new home was in an area with many herds of deer. This became evident after we spent a large amount of time and money on our landscaping. One day about two or three weeks after our planting, we looked in the front and most, if not all, of our beautiful plants were half eaten. As you can imagine, this was not only sad, but eye opening. We had to find plants that were “deer-proof”. After a tremendous amount of research (thank you internet! ), we began to understand that there are really very few, if any, deer-proof plants. Those guys will eat almost anything if they are hungry enough. Thus became our journey to find “deer-resistant” plants that would be considered as food only if there was nothing else around. One of the first things we noticed about the plants that were in the yard when we purchased the home, the three large rhododendrons were unscathed. The lavender, rosemary and sage were untouched as well, but that made sense as they all are filled with very fragrant oils that apparently are off-putting to deer. But rhodies? They seem to have no scent discernible to humans, but the deer act as if they don’t exist. 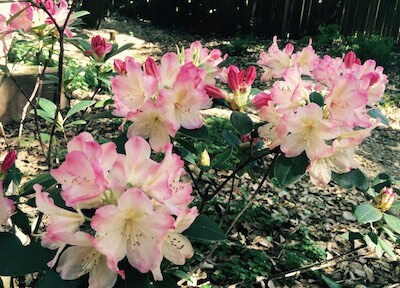 So we planted lots of rhododendrons, about 45 of them spread out over the yard, they are thriving under our redwood, oak and bay trees. One other plant that the deer seem to ignore are gardenias. Every now and then I can see that one of them nipped on a flower, but they seem to dislike the taste and leave the rest of the flower alone and move on, to my neighbor’s delicious plants. If you want to keep your plants, and not feed the local large ruminant mammals, plant rhododendrons, lavender, rosemary, sage and don’t forget the incredibly fragrant gardenias.